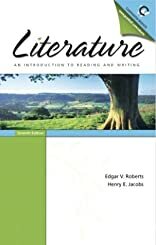 LITERATURE: AN INTRODUCTION TO READING AND WRITING.Sixth edition. Literature an Introduction to Reading and Writing was written by Edgar V. Roberts. About Edgar V. Roberts (Author) : Edgar V. Roberts is a published author of young adult books. Some of the published credits of Edgar V. Roberts include Literature: An Introduction to Reading and Writing.